37% Of Millennials Say They Won’t NEED Social Security #infographic ~ Visualistan '+g+"
In October of 2018, Provision Living surveyed 2,000 Americans and asked them to envision their ideal retirement lifestyle. Surveyed respondents were surveyed on everything from ideal retirement age, to retirement savings, to where they pictured themselves living when they’ve retired. 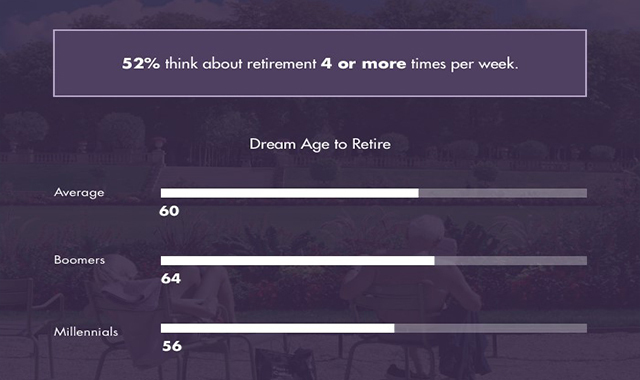 The survey found that 52% of Americans think about retirement 4 or more times per week. The dream age for retirement varied between the different generations that were surveyed although the average dream age to retire was 60 years old. Boomers said 64 years where Millennials were more optimistic saying they hoped to retire by age 56. Surveyed respondents were also asked about their ideal local to retire. They found that over 78% of respondents were happy to retire in the United States. Only 21% wanted to retire aboard and the top country that people wanted to retire abroad was Italy.